I’ve never been a big Xtina fan, particularly in her Dirrty days and dirrtier styling, but I read her recent Instyle interview yesterday and found myself wishing her well. The woman, to quote her own lyrics, is most certainly a fighter and has navigated her way through fame’s fickle corridors while others have crashed and burned around her in their droves. Now Ms Aguilera is poised to add another feather to her cap with the release of her first movie, Burlesque, and while I won’t be queuing to see it on the big screen, I might watch it on the sofa with a glass of wine and a bucket of kettle crisps some night himself is off gallivanting around town. However, I’m a little bit more excited about how Arnotts have chosen to welcome the film’s release. An email pinging into my inbox tells me that the Arnotts Beauty Hall will be transformed into a Burlesque ‘show-stopping theatre’ from Thursday 2nd to Sunday 5th of December. Apparently, shoppers will be greeted by live Burlesque performances and all customers will be in with a chance to win a fantastic prize: a once in a lifetime trip to Hollywood, including an access all areas trip to the Sony Studios where the movie was made. 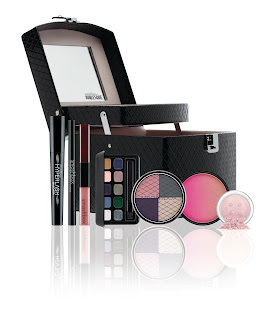 Smashbox Cosmetics are the official partners of the movie, (their burlesque collection is pictured, right) and their make- up artist Christopher Loh will be flying in to help re-create some of the looks from the film. The other beauty counters in the store will be getting in on the action too, so expect to see some fabulous, flamboyant faces over the course of the 4 day event. @Karen, the beauty event is next weekend so hold off till then! 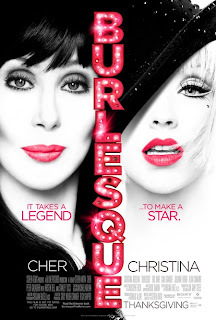 I will definitely be popping along to see Burlesque. The frivolity of it all is much needed at the moment! I want to go! I love burlesque. club noir Christmas extravaganza coming soon and another time to squeeze myself in to my corset... which makes my waist a size 6!! a size 6!!!!!! Agree with the earlier post. Great to have something frivolity! I will probably be dragged along to see the film by my boyfriend. But none of my friends would be happy with burlesque style make up as Christmas presents so I will probably give Arnotts a miss. Thanks for the info though. @Anonymous -- your boyfriend will drag you along?! Somehow I pictured things being more of the other way round -- even if the film does star the gorgeous Ms Aguilera...!